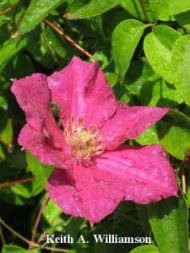 Clematis is the July Plant of the Month for Boulder, Colorado landscapes – Glacier View Landscape and Design, Inc. Pink, red, white, purple, multi-colored, blue….the list goes on for the colors available for Clematis to plant in Colorado. There are over 300 different species!! Long a gardener’s favorite, Clematis has been planted as a creeping, crawling, vine since the mid 1800’s. It is generally considered a cool temperate climate species, not found in the tropics. 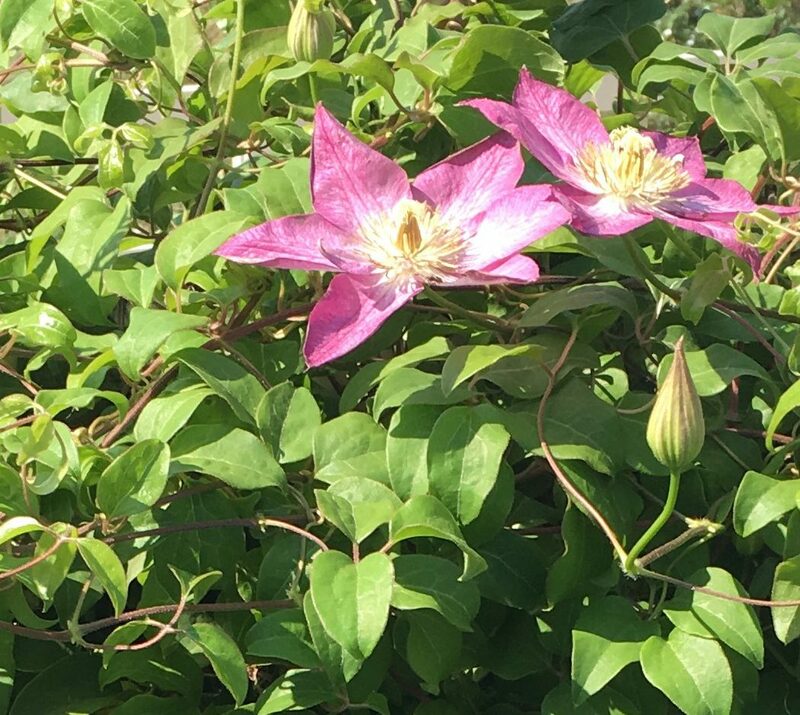 The timing and location of flowers varies with spring-blooming clematis flowering on the side shoots of the previous year’s stems, summer/fall blooming clematis bloom only on the ends of new stems, and twice-flowering clematis do both. 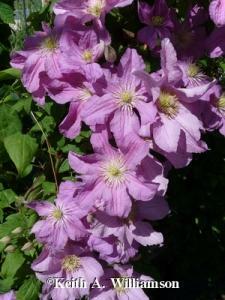 Clematis like to have their feet cool, moist and shaded, but their tops in the sun. They are great for trellises, arbors, pergolas and the like, but there are now a few bush varieties available that can add that beautiful splash of color anywhere in the garden. Pruning is not critically important, but one should remove the dead wood from the previous year once the new growth begins to emerge in the spring. After very cold winters, Clematis may die back to the soil and emerge anew from the ground. Be patient with them and once they get going they can add 3” per day….they grow rapidly once the conditions are right. Plant a few on your fence and see what happens….mix the colors for a great display. Here are a few species to try in our region near Erie, Colorado. ‘Comtesse de Bouchard’, ‘Ernest Markham’, ‘Gillian Blades’, ‘Henryi’, ‘Jackmanii’ the long standing favorite, ‘Nelly Moser’, ‘Ramona’, ‘Mongolian Bells’ Bush variety, ‘Western Virgin’s Bower’, ‘Pink Anemone’, and the fall blooming ‘Sweet Autumn’. Have some fun. I’m in love with this monthly series!